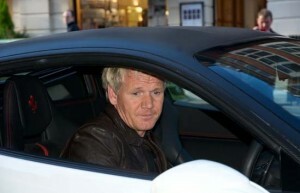 UK celebrity chef Gordon Ramsay of MasterChef and Hell's Kitchen was pulled over earlier this week by a police officer in Los Angeles for driving his brand-new Maserati on the wrong side of the street. According to the Michelin-starred chef, he momentarily forgot he was in America. "For a moment I thought I was back in England and turned down the wrong side of the road," he said in an interview with The Sun. But the story doesn't end there. According to Ramsay, the police officer started yelling and "pulling his gun" when Ramsay attempted to leave his vehicle, believing he had stolen the Maserati. Ramsay also admitted that it was "half past midnight and I've got no ID on me." In the end, Ramsay was saved by his fans -- a group of girls leaving a late-night visit to a local pizza eatery. He said, "They come out and start going 'Hey, Chef Ramsay, we love you!' The cop's like, 'Who are you?' I say, 'Chef Ramsay,' and I have my life back again." Ramsay's thoughts may well be preoccupied in the UK with Bread Street Kitchen, a new venture from Gordon Ramsay Holdings at London's One New Change set to accept bookings starting this month on the 26th. It features a vast wine bar and a small plates menu available from early morning through late night hours. More information is available at www.breadstreetkitchen.com. Mark Sargeant Leaves “Gordon Ramsay At Claridge’s”: Who Knew? I guess he’s getting confused with which country he’s in. But how dumb can you be to not have any id on you. I guess he believes he is recognized by everyone.. How arrogant is that? Do drivers in the UK drive around without ID? Too Sad!! Good thing the late night group of girls were around… The cop’s motto was probably “shoot first and ask questions later”. Sadder still.